Hog Canyon is one of the largest tributaries of North Wash, near the upper end of Lake Powell, and is different to other drainages hereabouts as it contains a permanent stream, bordered by reeds, bamboo, oak and cottonwood trees for 2 miles, as far as the source of the water at a series of springs. The creek forms pools, cascades and smooth channels where the water flows over exposed, thin-bedded sandstone, and a faint path leads along for a mile or so, starting at a recently improved rest/recreation area beside UT 95. 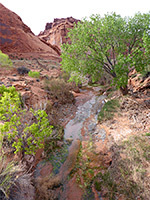 The scenery is nice enough, with the greenery around the stream contrasting with the red, multilayered cliffs of Wingate and Kayenta sandstone that rise up to 800 feet above, though most of the canyon is wide, and the creek is enclosed by sandbanks and benches that in places provide an easier route for hiking. 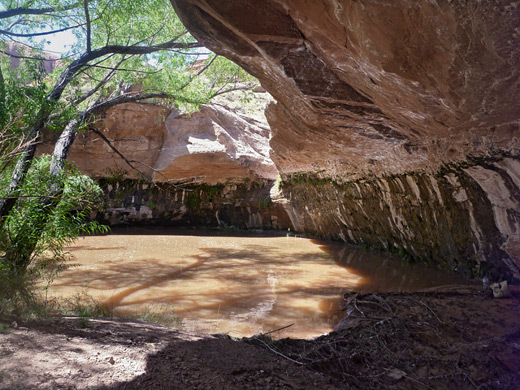 In the upper end of the canyon, however, the drainage splits into three forks, just as the ravine reaches the slot-forming Navajo sandstone, and each has typical North Wash-area features of pools, chokestones and tight narrows that angle upwards quite steeply. 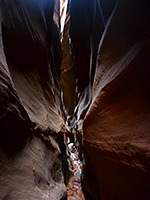 Like most such slots the passageways can only be explored fully if starting from the top, via a combination of downclimbing and rappelling, but as usual some can be seen without any equipment if entering from below. Topographic map of Hog Canyon. 19 views of Hog Canyon; gallery, slideshow. The upper tributaries of Hog Canyon can be reached from the west, by driving 2.1 miles along a level, narrow dirt track that forks off UT 276 half way between mileposts 3 and 4, but the simpler approach, and the one used if just visiting the riparian lower canyon starts from Hog Springs Recreation Area, on the west side of UT 95 at mile 33.5; this BLM-managed facility has rest rooms, a large parking area and a sturdy wooden suspension bridge over the stream leading to some sheltered picnic tables, from where the lightly used trail heads up the valley, staying close to the streamway. The path fades away after a while and can be difficult to follow in some places where it crosses dense vegetation, though periodic floods often flatten all growth making progress much easier, and at other times walking may be quicker on the sandy slopes above the creek. The waters of Hog Creek flow over exposed strata every so often, creating cascades and small waterfalls, often with a pool below. One of these, reached just after the junction with the third tributary ravine on the south side (one mile from the trailhead), is several feet deep, and contained in a photogenic grotto enclosed by curving, overhanging walls that are streaked with desert varnish and partly covered by green plants. The water in the lower canyon is often muddy, odorous and occasionally oily, but is cleaner (and drinkable) in the upper reaches. 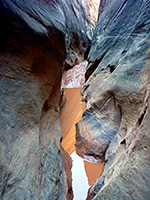 The ravine gains height only gradually, rising slowly through the Wingate and Kayenta layers, as the surrounding cliffs remain half a mile or more apart, and the gorge is still rather wide at the springs, reached after 2 miles, at the center of a longer band of impenetrable vegetation. This may be passed using a sandy bench on the southwest side, descending just beyond to a bushy area at the junction with the first (easternmost) of the slot canyon tributaries, known as Hog 3. Hog 2 branches off 0.3 miles later, again on the north side, while the main drainage (Hog 1, aka Boss Hog) also soon narrows; the canyon is now completely enclosed by smooth slopes of Navajo sandstone, up to 400 feet high and mostly not climbable, though there is a difficult route up the slickrock to the north, between Hog 1 and Hog 2, and an easier way up a steep gully to the west. 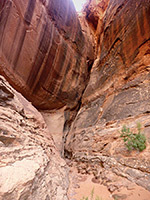 After scrambling up a steep, overgrown, boulder-filled slope through the top of the Kayenta sandstone, the drainage enters the Navajo layer and has a short, confined, sandy-floored passage ending at an unclimbable vertical crack leading to shallow slots above. The junction with Hog 2 is already in the Navajo sandstone so the approach is easier; sand banks and a group of trees give way to a longer narrow channel bordered by sheer, streaked cliffs and ending at a dark chamber holding a deepish pool, at the far side of which (several feet above the water) is a twisting slot curving upwards quite a long way and so obscuring most light, again not possible to ascend. The main canyon narrows quite abruptly into a tight, enclosed slot with shallow pools and a few small chokestones, quickly becoming around 50 feet deep, just a couple of feet across, and rather dark. The passages are pretty but easy progress is halted after a few minutes by a slanted, angled drop of around 30 feet, beneath a temporarily more open section.